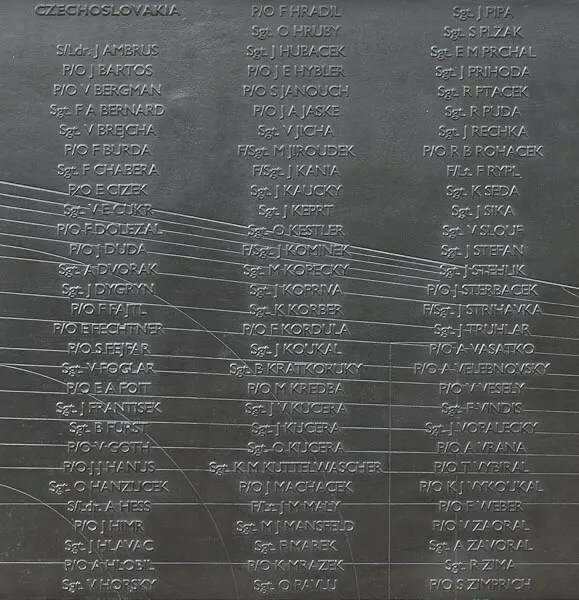 To commemorate the 100th anniversary of the birth of F/Lt Miroslav Kredba, members of Československá obec legionářská Jednota Mladá Boleslav attended his symbolic grave at the family plot in Sýčina to lay a wreath. 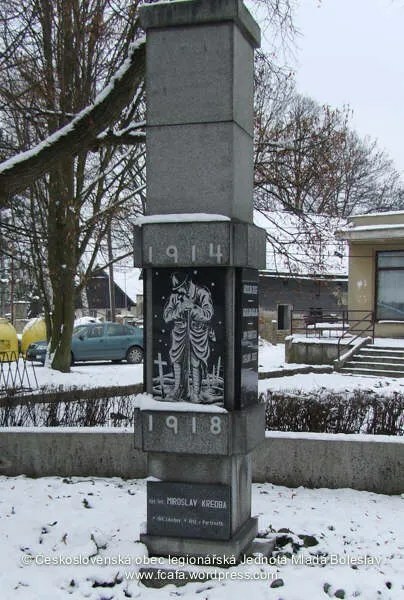 F/Lt Miroslav Kredba was born 29 January 1914 at Libichov, near Mladá Boleslav. 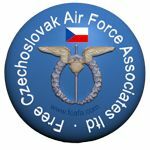 He served in the pre-WW2 Czechoslovak Air Force as a fighter pilot with the 4th Air Regiment who were based at Pardubice. Following the German occupation of Czechoslovakia in March 1939, he escaped through Slovakia, Romania and Yugoslavia. Here, with other escaped Czechoslovak military he boarded a ship which took them to Istanbul, Beurit and onto Marseille, France. In France he was transferred to the Czechoslovak Depot at Agde. 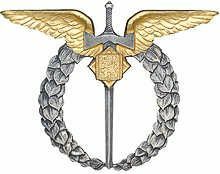 Before he was accepted into l’Armée de l’Air, Germany invaded France and their rapid advance forced the French forces to constantly retreat westwards during the Battle of France. With the French capitulation imminent, the Czechoslovak airmen were released from French military service so that they could be evacuated. With other Czechoslovak airmen, he managed to reach the Mérignac airbase at Bordeaux. 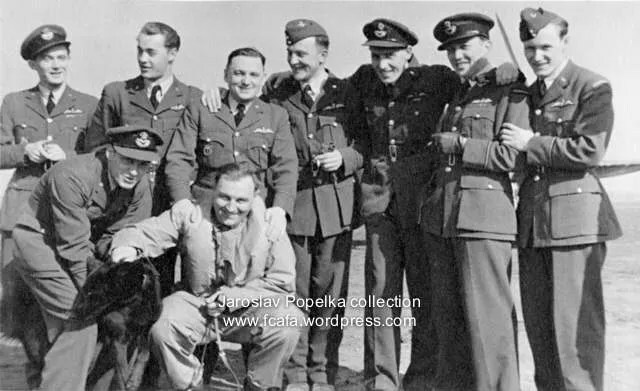 On 17 June 1940, with a group of 38 Czechoslovak airmen, led by kpt.let. Ferdinand Secký, he boarded the last BOAC flight, a four-engined Armstrong Whitworth aircraft, G-ADSV, AV1160, to leave the bomb damaged airbase. After a flight lasting 5½ hours, at an altitude of 150 to 200 mtrs, they landed at 21:30 at Hendon, England. 310 Sqn, Duxford July 1940, Miroslav Kredba, in l’Armée de l'Air uniform, standing 2nd from left. 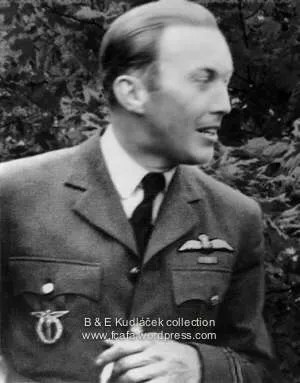 He was accepted into the RAF Volunteer Reserve, at the rank of P/O, on 12 July 1940 and posted to the newly formed 310 Sqn (Czechoslovak) at Duxford where he re-trained on Hurricane Mk I aircraft and began to learn English. He was one of the 88 Czechoslovak pilots who flew in the Battle of Britain, his first operational flight for 310 Sqn was the morning of 20 August, flying Hurricane Mk I P3148. During the Battle of Britain he did not achieve combat success but was shot down twice. First in a dog-fight over the Thames Estuary, at 13:30 on 31 August, when his Hurricane ‘P8814’ was shot down by a Me 109 but he managed to bail-out and land safely near Hornchurch. The second time was on 5 September at 15:40 on 5 September, by a Me 109 whilst flying a patrol in Hurricane Mk I, NN-N ‘P2148’. He managed to make a forced landing near Epping sustaining only light injuries. After the Battle of Britain he continued his operational tour with 310 Sqn but achieved no combat success. On 29 May 1941 he was appointed Flight Commander of the squadron’s ‘B’ Flight. 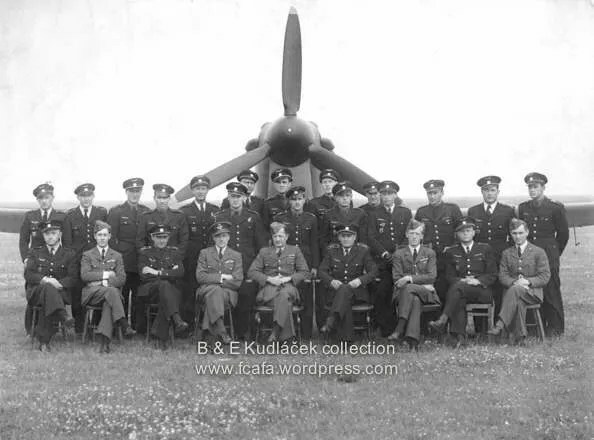 310 Sqn, Duxford 1941, Miroslav Kredba standing 2nd from right. He was killed on 14 February 1942 at Perranporth airfield. At 6:20, at the start of a training flight, he was taking-off in poor visibility , with two other Spitfires, to practise night take-off’s and landings. In taking-off, his Spitfire NN-X AD414, for an unknown reason his aircraft veered 40 degrees to the left. On leaving the ground he failed to make enough height and his starboard undercarriage leg hitting the top of a aircraft dispersal pen. 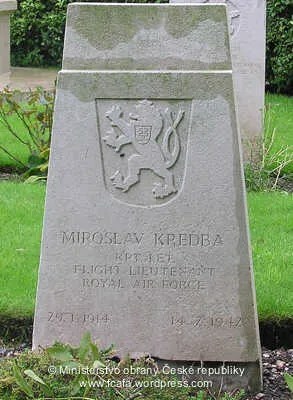 F/Lt Miroslav Kredba was buried on 18 February 1942 in grave 12, row 1 at St. Illogan Cemetery in Camborne Redruth, Cornwall. At his birth village of Libichov he is remembered on the war memorial .